There is an established forensic need to link between a given pistol (or any other firearm) and a suspect, who often denies ownership of that pistol, or claims that it was never touched. Pistols and other firearms are sometimes linked to their holders via their Iron print (induced by iron reaction with human sweat), which can be developed on the suspect's holding hand by special chemicals. However, there is a growing need for alternative forensic methods as some pistols or firearms have chromium coated or plastic based handles which are incompatible with the Iron print technique. In addition, the Iron print method is performed on the human suspect hand, and an alternative method based on field sample collection followed by laboratory analysis would be advantageous. Every pistol and fire arm is lubricated by special oil for its improved maintenance and unhindered operation. This oil unavoidably touches the holding hand and consequently must leave its deposit on the holding hand. The oils used typically consist of a range of hydrocarbons, often aliphatic hydrocarbons that are distributed in a range of isomers. Thus, pistol oil analysis on a human hand can serve as an effective new method for linking between a given pistol and/or fire arm to the hand that held it, given that a suitable method and instrument will be found for obtaining a unique pistol oil characterization finger print. 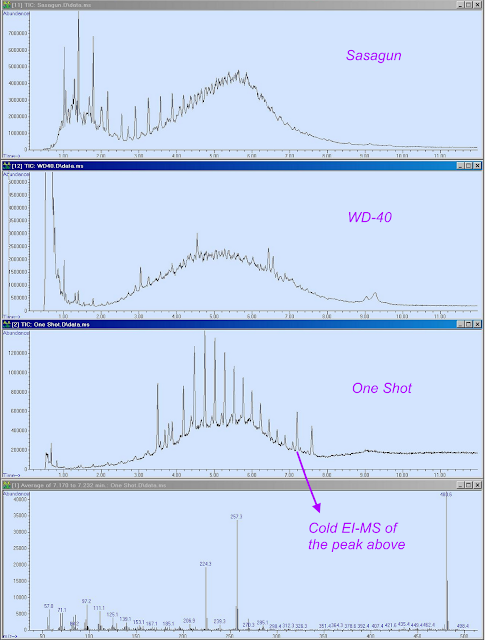 Keep reading how the Aviv Analytical 5975-SMB GC-MS with Cold EI enables the verification of pistol holding. The Aviv Analytical 5975-SMB GC-MS with Cold EI uniquely enables trace level analysis of hydrocarbons via their molecular ions and the exploration of their isomer distributions for their correlation with the various oils origins. For further information on GC-MS with Cold EI and on the possible use of isomer abundance analysis for oil characterization please refer to A. B. Fialkov and A. Amirav "Hydrocarbons and Fuel Analysis with the Supersonic GC-MS - The Novel Concept of Isomer Abundance Analysis". J. Chromatogr. A. 1195, 127-135 (2008). 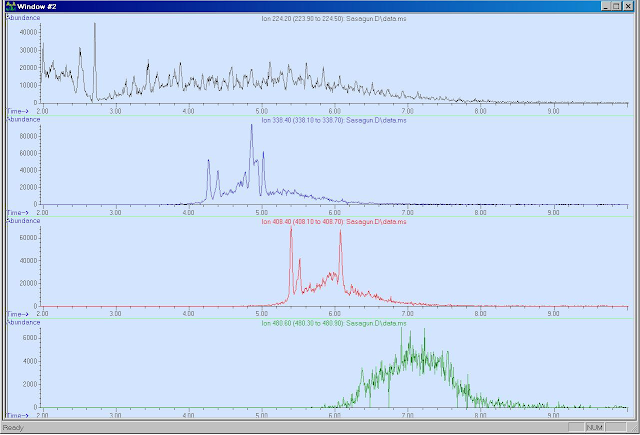 One of the main features of the Aviv Analytical 5975-SMB GC-MS with Cold EI, is the enhanced abundances of molecular ions which are observed and can be abundant for all isomers, combined with isomer related structurally informative fragments mass spectral peaks. Further information and a demonstration of isomer distribution analysis can be found in our post: "Hydrocarbon Isomers - Why Aren't They Analyzed". Furthermore, it has an extended range of compounds that are amenable for analysis, including low volatility large oil and wax compounds that cannot be analyzed by standard GC-MS. 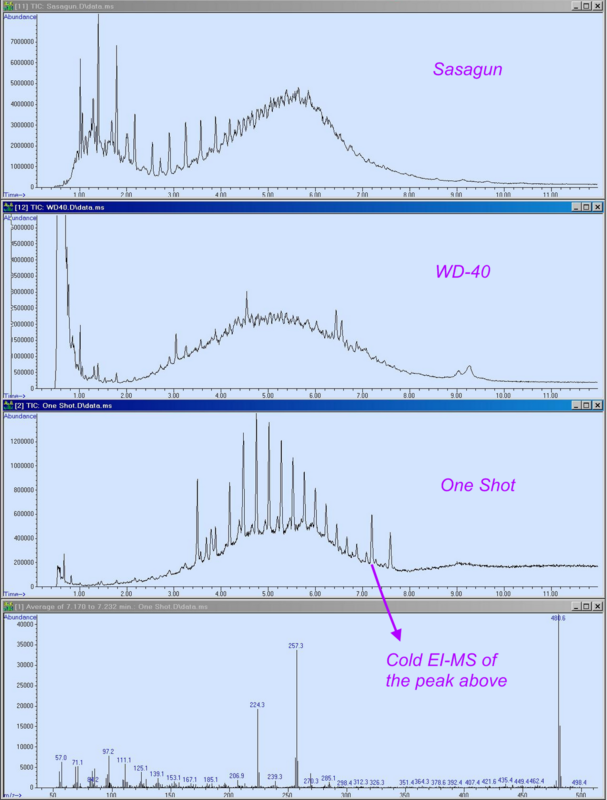 In addition, the 5975-SMB GC-MS enables much shorter analysis time and improved sensitivity that can be over three orders of magnitude on the molecular ions of large hydrocarbons as can be seen in the post "By how much is the Molecular Ion Enhanced in Cold EI". Sasagun oil which is an Israeli brand. WD 40 which is a general purpose "water displacement" oil that is sometimes used for fire arm maintenance since it is readily available. One Shot oil (www.hornady.com/store/One-Shot-Gun-Cleaner/) which is a special purpose gun cleaner oil. These oils were diluted to 1% in hexane and analyzed by the Aviv Analytical 5975-SMB GC-MS with Cold EI using the experimental conditions listed below. The One Shot oil was also brought in contact with the hand of a volunteer which was later lightly washed and wiped. An ear swab pre cleaned with acetone was used to collect the oil from the volunteer's hand. The swab was dipped in acetone (in a 1 ml vial partially filled with about 200 µL acetone) and than swiped over the volunteer's hand. This process was repeated twice and after each time the swab was dipped again in the 200 µL acetone vial. This acetone extract was later injected as is for the analysis of pistol oil on human hand. System: Aviv Analytical 5975-SMB GC-MS with Cold EI system that is based on the combination of an Agilent 5975 MSD with the Aviv Analytical supersonic molecular beam interface and its unique fly-through ion source. Injection: 1 µL at 250ºC with split ratio 10. Sample: Sasagun pistol oil (Israeli brand), One Shot pistol oil and WD 40 general purpose oil. These samples were diluted to 1% in n-hexane. Sample on-hand was collected with acetone wetted pre cleaned ear swab. He column flow rate: 5 ml/min. Oven: 50ºC followed by 30ºC/min to 320ºC and 3 min hold for total of 12 min. Cold EI Source: 12 mA emission, 70 eV electron energy, 56 ml/min He makeup flow. 5975 mass range: 50-500 amu at about 3.2 Hz scan frequency. Results – The development of a new method for linking a pistol or firearm to a man that held it. 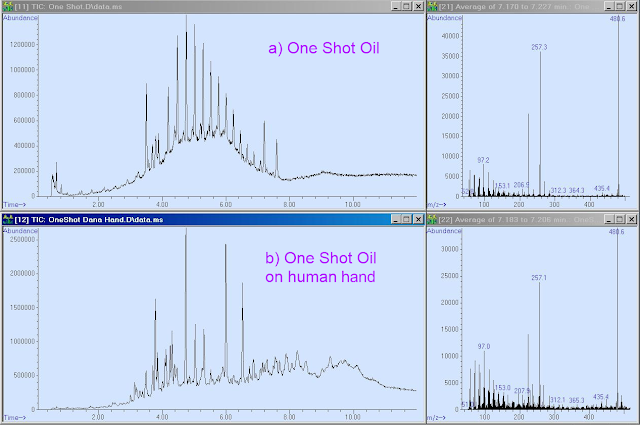 As shown in Figure 1, each of the three explored pistol maintenance oils had a distinct total ion chromatogram (TIC) pattern. However, as shown in Figure 2, we found that the TIC patterns are irrelevant to the oil when the oil is sampled from a human hand due to massive interferences by the human hand natural wax and various contaminations. The human hand TIC includes major peaks of cholesterol, squalene, palmitic acid and many other natural compounds plus "additives". A unique additional main peak found on the volunteer's hand was Parson MCX (C18H26O3) which originates from a UV sun light protection cream. This compound is unique to that volunteer hand and might offer additional forensic value if found on the pistol surface. As a result, each pistol oil had to be characterized for the presence of specific hydrocarbons and their isomer patterns (distributions) or for the presence of other specific marker compounds. In Figure 1 we also show the mass spectrum of palmityl patmitate ester which seems like a good candidate for serving as a specific One Shot oil marker, as it has a unique and highly characteristic Cold EI mass spectrum with dominant molecular ion at m/z=480.6 along with an abundant m/z=257 fragment. In addition, this large ester is a rare compound that is not found on human hands or in the two other pistol oils that were investigated. Thus, our method of oil characterization utilized four ions and for the One Shot oil we have selected m/z=224.2 which belongs to a prominent oil TIC peak (possibly hexadecane and/or hexadecanol) plus two hydrocarbons m/z=338.3 and 408.4 of C24H50 and C29H60 and m/z=480.5 which is the molecular ion of palmityl palmitate. As shown in Figure 3, very good fit was obtained between the above four ions RSIM traces of the pure One Shot oil and the four same ions traces were obtained from the TIC of the oil contaminated human hand extract (and with about similar relative intensities). This similarity is striking in view of the very large difference between the two samples TIC patterns. 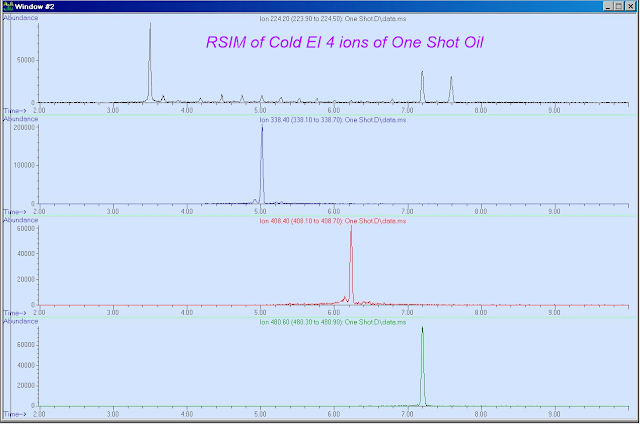 Furthermore, in Figure 4 we show that the same type of four ions RSIM traces performed on Sasagun oil provide completely different traces, with no resemblance to the One Shot oil. Thus, we conclude that not only our method can link between a pistol or firearm and the holding hand but it can also link the holding hand to a pistol with a specific maintenance oil. Note that the two hydrocarbons RSIM traces on m/z=338.3 and 408.4 of C24H50 and C29H60 resulted in a one major peak only at 5 and 6.2 min elution times respectively plus a minor additional isomer peak near these elution times. This finding is rare and proves that these hydrocarbons are from a synthetic origin in view of the absence of natural isomer patterns as commonly found in mineral oils. In addition, while good sensitivity is demonstrated in the figures below, the sensitivity can be significantly further improved via the use of simultaneous full scan and SIM on the few selected ions. Finally, we note that this new method can help in the task of linking between a suspect and a given pistol or firearm without bringing the suspect to the laboratory or the laboratory to the suspect, as the method involves a simple suspect swabbing in the field while bringing only the swabs to the laboratory. Molecular ions are exhibited for all the oil sample compounds including for large linear chain hydrocarbons, highly branched hydrocarbon isomers and large esters. The universal availability of molecular ions enables the use of RSIM traces while looking for unique isomer distribution fingerprints. The enhanced molecular ions and lack of ion source peak tailing significantly improves the detection sensitivity which is over three orders of magnitude better than of standard GC-MS for large hydrocarbons. Such good sensitivity is essential for trace oil analysis on human hands. The use of short column (5 m) with high column flow rate (5 ml/min) enables the analysis of oils including their large constituents. The use of short column (5 m) with high column flow rate (5 ml/min) enables fast analysis of oils in 12 minutes as compared to standard GC-MS oil analysis of 40-50 minutes. This rapid analysis further contributes to make this new method more practical. Figure 1. 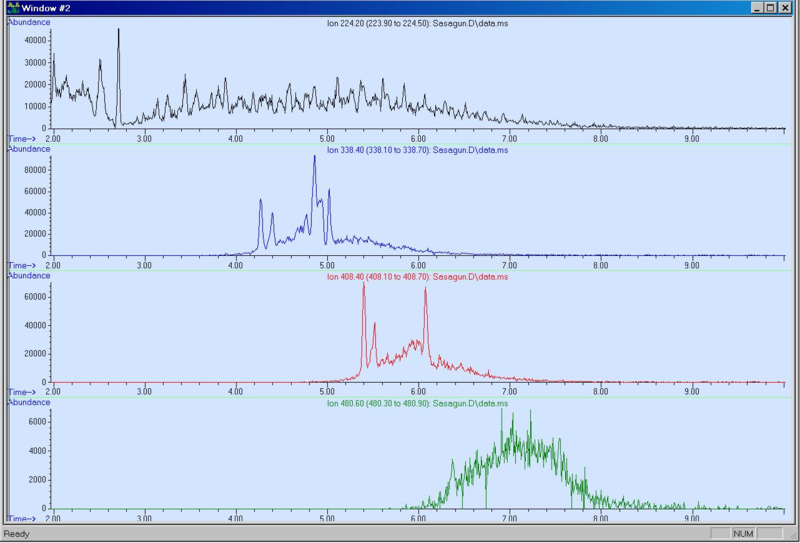 Total Ion Chromatograms (TIC) in full scan mode of pistol oils; a) Sasagun (upper trace); b) WD 40 (second middle trace); and c) One Shot (third trace). 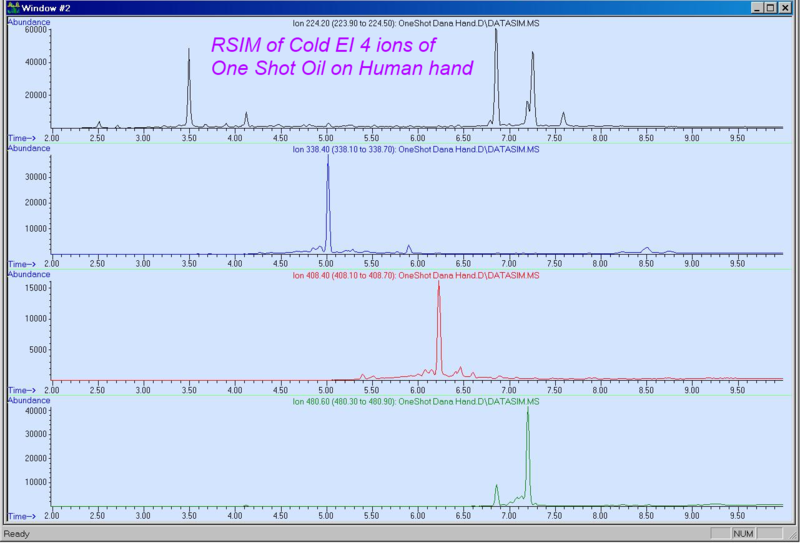 The bottom trace is the resulting Cold EI mass spectrum of the One Shot oil peak at 7.2 min elution time. It was positively identified by the NIST library as palmityl palmitate ester CH3(CH2)14CO2(CH2)15CH3 (MW=480.5). Note the Cold EI mass spectrum with dominant molecular ion. In contrast, standard EI MS of this compound is characterized by a much weaker molecular ion. As observed, the TIC of the three oils are very different but these differences are anticipated to be eroded on human hands. Click on the Image to zoom. Figure 2. Total ion mass chromatograms of One Shot pistol oils; a) Clean One Shot oil (upper left trace); b) One Shot oil swabbed from a human hand that touched this oil after light washing and wiping of the hand. Note that the mass chromatograms are very different and have no resemblance to each other. However, as shown in the right side Cold EI mass spectra, palmityl palmitate ester was found at the same 7.2 min elution time in both oil and oil on hand extract, already hinting on the existence of the One Shot oil on the human hand. Palmityl palmitate is a rare compound that is not found on a human hand or in any other regular oil, including in the Sasagun and WD 40. Thus, its presence can serve as a good marker for One Shot oil in view of its highly distinct Cold EI mass spectrum with dominant molecular ion and abundant m/z=257 fragment peak. Click on the Image to zoom. Figure 3. Reconstructed single ion mass chromatograms (RSIM) of One Shot oil (four upper traces) on m/z=, 224.2, 338.4, 408.4 and 480.8. 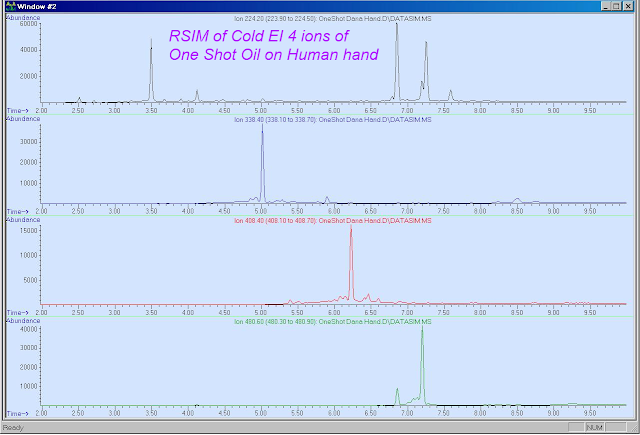 The four bottom traces are RSIM traces on the same m/z values but from the full scan mass chromatogram of One Shot oil extract from the human hand. Note the high similarity between the two samples four RSIM traces in having all the four peaks of the three hydrocarbons plus the palmityl palmitate ester in both the clean oil and its hand extract. In addition, the traces of the m/z=338.4 and 408.4 are unique in having no or very little isomers, hence indicating to a synthetic oil source. Click on the Images to zoom. Figure 4. Reconstructed single ion mass chromatograms (RSIM) of Sasagun pistol oil on m/z=, 224.2, 338.4, 408.4 and 480.8. As observed, these four traces are very different from the related four traces of the One Shot oil, and have no clear peak at the same elution times. Similar large differences are observed in a comparison with WD 40 oil. Thus, isomer distributions and molecular ions specific mass chromatograms can serve to properly characterize the various pistol oils and for the identification of its residues on human hands. Click on the Image to zoom.